The What: Crestron is now shipping its new 24-Port Keystone Patch Panel (DM-RPP-K24), DigitalMedia ULTRA RJ 45 Keystone Jacks (DM-CONN-ULTRA-RECP), and pre-terminated DigitalMedia CAT6A cables in various lengths (DM-CBL-ULTRA-PC). These new products are designed to bring AV into the IT world, and make cabling, installing, and servicing systems much cleaner, faster, and easier. The What Else: As AV systems demand higher bandwidths and faster speeds, shielded category cables are required. These cables, however, are more sensitive and difficult to terminate in the field. Inconsistent terminations and sharp cable bends often associated with traditional AV installations impede system performance. With so much more technology installed, directly connecting field cables to the rack is messy and confusing, obstructs accessibility to the rack, and makes testing, servicing, and moving equipment nearly impossible. Now, with color coded (blue for DM) keystone jacks in wall plates in the rooms, and in patch panels in the equipment room, field cables never need to be touched once they’re installed. All the field cabling is installed, crimped to the keystone jacks at each end, labeled, and tested in advance. Then, the AV gear in the rack simply plugs into the appropriate keystone jack in the patch panel using the pre-terminated DM ULTRA patch cables. The new pre-terminated RJ45 male patch cables are available in various lengths: 1.5, 3, 5, 7, 10, 15, 20, and 50 feet. 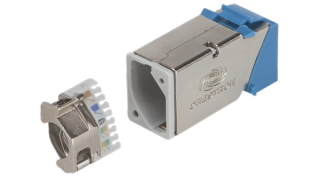 DM ULTRA RJ45 keystone female jacks are available in a box of either 20 or 50, and each includes one crimping tool. Terminating field cables using the new tool is extremely easy, and is typically done in less than one minute. The Bottom Line: The new Crestron DigitalMedia ULTRA cables, connectors, patch panels, and wall plates provide enterprise-grade signal routing and performance that exceed 4K/60 4:4:4 up to 100 meters. All cables are fully shielded and Cat-6A compliant. The DM ULTRA keystone jacks can be used with off-the-shelf wall plates, panels, and back boxes.